After waking up in NYC early on 17th July, we wolfed down some leftover bagels courtesy of Allen Katz, and were on our way. We caught the Amtrak from Penn Station and we were Philly-bound! I had never taken the Amtrak before and I was pleasantly surprised: roomy seats, big carriages and very quiet. Perfect for a well-needed post-bagel nap. Andrew Auweda, President of Philadelphia Distilling, was there to greet us as we pulled into 30th Street Station. After giving us a warm welcome, he revealed an itinerary packed full of fun. We jumped in his SUV and headed on our way. The first stop was a light jog up the steps of the Philadelphia Museum of Art, just like Rocky Balboa. The statue of him is at the bottom of the steps now, instead of the top. But the feeling you get up there is still magic. And, yes, I was singing ‘Eye of the Tiger’ to myself as I jogged up. The sun was beating down and we were melting (and not just because of the aforementioned light exercise) so we headed off for some lunch. En route to lunch we did a little detour through the streets of Philly while Andrew told us about the landmarks: The Liberty Bell; Independence Hall; City Hall; the Museum of the American Revolution and Rittenhouse Square. 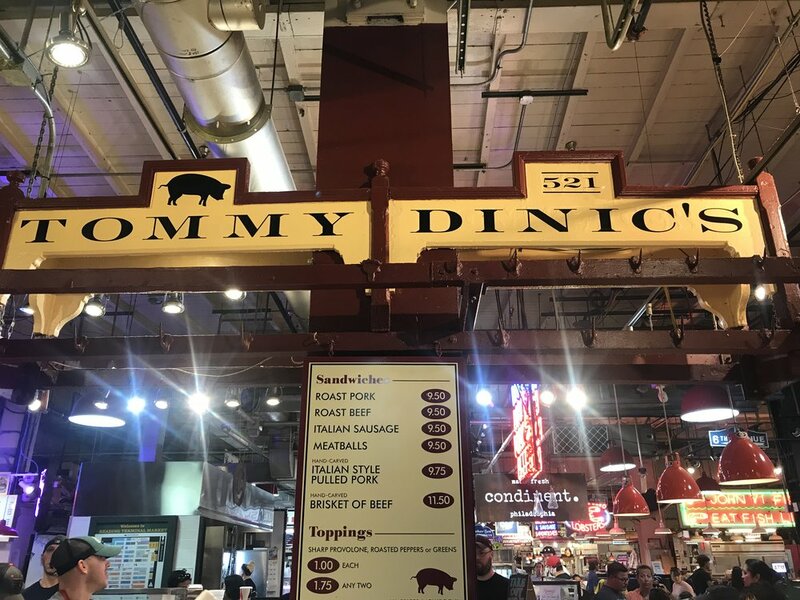 We eventually ended up at Reading Terminal Market for some lunch. This famous indoor farmers’ market has been operating since 1892. We met up with Aaron, head distiller at Philadelphia Distilling, at Tommy Dinic’s, a world famous sandwich shop. Its speciality is a roast pork sandwich — it was out of this world. It took us some time to defeat the mega sandwich but we were victorious and headed off to the distillery. The distillery is set in an old metal processing warehouse that had been vacant for years. A lot of its history is on display: bare-brick walls, steel girders and a ton of graffiti. The site is massive, about 15,000 sq ft and includes a gift shop, tasting room, bar/restaurant, lab, cask storage and, of course, two beautiful copper Forsyths stills. We started to have a look around with Aaron when Andrew interrupted to tell us that today was our lucky day: Bluecoat Gin was about to be made on the stills for the 1,000th time. How bloody cool is that? We got to prime the still, then load it up with neutral grain spirit and botanicals for the 1,000th batch ‒ totally awesome. I got a great shot of Emma Sprackling excitedly filling the still with some citrus botanicals! We turned the still on and let the magic happen. We’d seen the bottling line, the botanical chamber, the swag container (lots of fun was had here ‒ think kids in a candy shop) and Andrew’s office. The last stop was the lab, where we got to try out loads of crazy new concoctions ‒ even some delicious Amaro, watch this space. The space itself is beautiful; it’s well thought-out, the tour flows nicely, perfectly following the production process and even the toilets are awesome. The distillery is actually part of a larger entertainment complex run by LiveNation. There are two venues: a 2,500-capacity concert hall called the Fillmore and the separate 450-capacity Foundry Club, so there’s a lot going on. We were starting to get a bit thirsty and, with a giant bar just sitting there, it was time for some Bluecoat Gin beverages. We nominated Smillie to get the Clover Clubs flowing. The bar itself was designed by famed designer Tobin Ellis. It’s beautiful: long and polished with great functionality behind the counter. We had our Clover Clubs, did a wee brand presentation video with Andrew and set off for dinner. Andrew had booked us in at a brand new opening called Spice Finch. The chef Jennifer Carroll is an old friend of his, so we got really well looked after. It’s Mediterranean cuisine and it’s delicious. We also had some frozen Corpse Reviver No.2 with Bluecoat Gin and, yes, it was banging. We finished up dinner and were back on the road. A quick Uber to the airport and on to New Orleans! It was a whirlwind six hours in Philly and we didn’t even scratch the surface. Team Maverick will be back soon, that’s for sure.